H. P. Lovecraft Letter to Farnsworth Wrigth (July 27, 1927), in Selected Letters 1925–1929 (Sauk City, Wisconsin: Arkham House, 1968), p.150. Howard Phillips Lovecraft was born at 9 a.m. on August 20, 1890, at his family home at 454 (then numbered 194) Angell Street in Providence, Rhode Island. His parents were Winfield Scott Lovecraft, a traveling salesman for Gorham Manufacturing Company, a large silver-plate and sterling company and Sarah Susan Phillips Lovecraft whose eccentric and sheltering behavior likely profoundly contributed to Lovecraft’s shut-in nature in adulthood. When Lovecraft was three his father had a mental break in a hotel room in Chicago of which the cause is not certain but evidence suggests that it was paresis, a form of neurosyphilis. He was brought back to Butler Hospital, where he remained paralyzed and comatose for five years before dying on July 19, 1898. Lovecraft’s early childhood despite showing profound intelligence (reciting poetry at age two, reading at age three, and writing at age six or seven) was marred by frequent sickness and was withdrawn from school after attending for only a year due to illness. He was raised by his mother his, two aunts and his grandfather – businessman and industrialist Whipple Van Buren Phillips. At the encouragement of his grandfather he consumed many classic tales such as Arabian Nights, which he read by the age of five; it was then that he adapted the pseudonym of “Abdul Alhazred, The Mad Arab” who later became the author of the cursed Necronomicon. His interests in the Arabian were discarded in favor of the Greek mythology, gleaned through Bulfinch’s Age of Fable and children's versions of the Iliad and the Odyssey. The earliest known work “The Poem of Ulysses” (1897), is a paraphrase of the Odyssey in 88 lines of internally rhyming verse. His grandfather fostered and interest in the weird and gothic, by entertaining Lovecraft with off-the-cuff weird tales in the Gothic mode. Due to his physical and perhaps mental illness Lovecraft spent much of his time alone reading and learning independent of a formal education. By eight he had discovered science, first chemistry, then astronomy. He began to compiling journals that contained scientific articles made by using gelatin and special ink to copy the original namely, The Scientific Gazette (1899–1907) and The Rhode Island Journal of Astronomy (1903–07), which were distributed amongst his friends. When he was finally able to enter high school he developed several long-lasting friendships with boys of his age and made his first appearance in print in 1906, when he wrote a letter on an astronomical matter to The Providence Sunday Journal. He began writing columns for several papers. In 1904 his grandfather died, and mismanagement of his estate left his family in a poor financial situation, and they were forced to move into much smaller accommodations from their lavish and comfortable Victorian home. Losing his home was incredibly hard on the sheltered adolescent Lovecraft and apparently contemplated suicide. In 1908 just before his graduation from high school, he suffered a nervous breakdown that forced him to leave school without graduating and blocked his acceptance to Brown University. Not achieving his goals in education were sources of great shame to Lovecraft in later years, although he was thought to be a formidable autodidact. 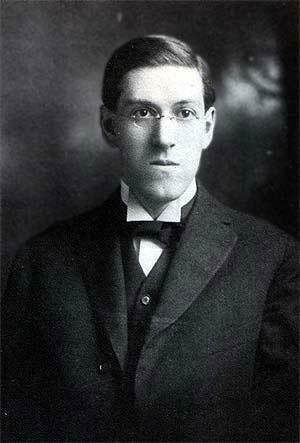 From 1908 to 1913 Lovecraft falls disappears from history, mostly pursuing his interests in astronomy and poetry. During this period and due to the cramped and isolated nature of his living circumstance he unhealthily close relationship with his mother, who was still suffering from the trauma of her husband’s illness and death, and who developed a pathological love-hate relationship with her son. If he would use a few less adjectives and more words which the general public arc familiar with than labyrinthine, laureled, luminary, lucubration, and many others… I get sore at people like H. P. L. I will pay his fifteen cents a month if he will quit reading Argosy. Jackson is great… I am a cow-puncher, and certainly would like to loosen up my .44-six on that man Lovecraft. Yours for luck. Excuse pencil, as ink is scarce at the Bijou Ranch. What vig'rous protests now assail my eyes? See Jackson's satellites in anger rise! 'Tis plain you please the fallen public ear. Edward F. Daas, President of the United Amateur Press Association (UAPA), a group of mostly amateur writers from around the country who wrote and published pulp magazines. Edward Daas invited Lovecraft to join the UAPA, and Lovecraft did so in early 1914. "In 1914, when the kindly hand of amateurdom was first extended to me, I was a close to the state of vegetation as any animal well can be ... With the advent of the United I obtained a renewal to live; a renewed sense of existence as other than a superfluous weight; and found a sphere in which I could feel that my efforts were not wholly futile. For the first time I could imagine that my clumsy gropings after art were a little more then faint cries lost in the unlistening world." It was in the amateur world that Lovecraft began writing after abandoning fiction writing in 1908. Lovecraft published thirteen issues of his own paper, The Conservative (1915–23), as well as contributing poetry and essays to many other journals. W. Paul Cook and others, noting the promise shown in such early tales as "The Beast in the Cave " (1905) and "The Alchemist" (1908), urged Lovecraft pen fiction again, which resulted in the writing "The Tomb" and "Dagon" in quick succession in the summer of 1917. Joshi, S. T. (1996). A Subtler Magick: The Writings and Philosophy of H. P. Lovecraft. Borgo Press. pp. 22, 41–42, 76–77, 107–108, 162, 229, 230. ISBN 1-880448-61-0.